SOUTHERN CALIFORNIA — The lifestyle of a liveaboard comes with certain romanticisms, most of which have nothing to do with Sonny Crockett ’s life aboard St. Vitus Dance. Living aboard a boat is not as simple as being on a floating home, as the “Miami Vice” television series might have suggested. Many liveaboards who spoke with The Log for this story often find living on the water to be rewarding. Common perks include freedom to travel, communal living at the docks and simplicity in lifestyle. Below is a sampling of a few liveaboards The Log connected with between Santa Barbara and San Diego. 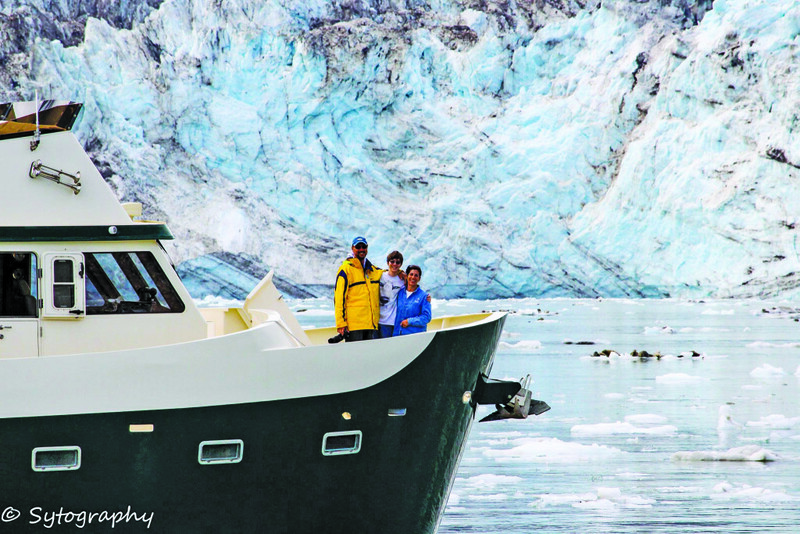 Does your liveaboard experience resemble the perspectives shared by these vessel dwellers? Are you ready to take the jump and live on the water? Santa Barbara Harbor is unique in permitting a handful of houseboats to complement the 113 allowable liveaboards. At least one person has experienced residing in a houseboat and as a liveaboard at Southern California’s northernmost harbor. Webb currently lives on one of four houseboats permitted in Santa Barbara Harbor. She was also a liveaboard there. The liveaboard lifestyle became a reality for Webb when she moved from New York City to Los Angeles, where she spent time living aboard a vessel in Marina del Rey. She eventually fell in love with Santa Barbara and took up residence at the city-owned harbor. “I love watching the sunrises, the sunsets, you’re close to nature,” Webb said of her attraction to the liveaboard lifestyle, adding her experiences living aboard have far exceeded her expectations. The natural diversity surrounding Santa Barbara Harbor and community feel on the docks helps make living aboard a vessel a pleasurable experience, Webb said. Another major perk Webb and other liveaboards identify with is privacy. “You know people on the dock for years and you see them, [but] most of the time you don’t go on their boats. To go onto a boat you have to be invited. I like that, people respect that privacy because [boats] are real small spaces,” Webb said. There are some challenges to living aboard a boat, of course. Webb pointed out rain and windy weather can cause some challenges. Sometimes your neighbor might be less-than-ideal. “If you’re next to someone who is loud, or has an unkempt boat, that could be a challenge,” Webb said. Overall, though, Webb said she enjoys the Santa Barbara Harbor community, adding people are personable, respectful of privacy and collegial. The marinas in Ventura Harbor are rather friendly to liveaboards, providing a sense of community. Many liveaboards also enjoy access to the Channel Islands National Park to the west and mountains to the east. Tony Porter, a liveaboard in Ventura Harbor, has observed some families living aboard boats where his vessel is docked. Tony Alcock first lived aboard a boat in the 1970s and returned to the lifestyle again a couple years ago. He wrote a book about living aboard a boat entitled “Life at the End of a Rope;” the book is expected to be available online and at bookstores in March. “It’s a lovely life. It’s very safe and people look out for each other. We all share the same problems and challenges,” Alcock said. Kevin, who requested to be cited by first name only for this story, has lived aboard a boat with his family for more than four years. He said being a liveaboard helps minimize clutter often found in homes on land. 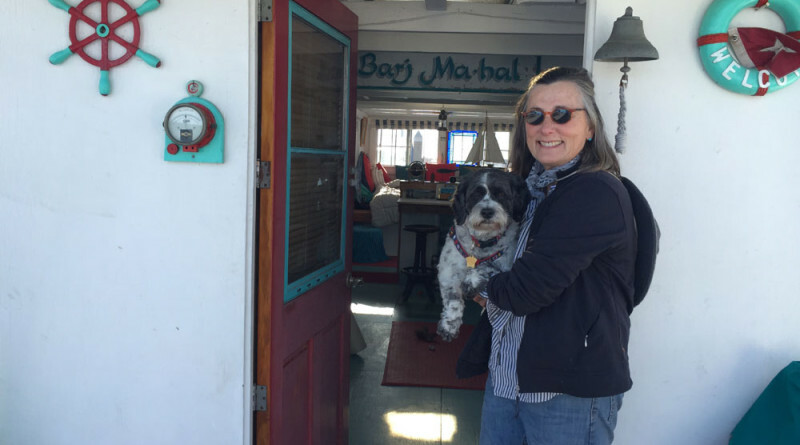 Living aboard a vessel means being okay with downsizing on material goods, according to Mary Lee Huber. “The biggest transition is learning to live small, [but] it is also incredibly freeing,” Huber said, adding dock parties, dinner dates and “buddy boating” are common phenomena among Ventura’s liveaboards. Maintaining a vessel can be challenging, each liveaboard stated, but with patience and work many issues can be solved. Monthly costs associated with being a liveaboard can vary from resident to resident, according to Alcock. Living aboard a 40-foot vessel in a marina where the slip fee is $20 per foot means a liveaboard would pay $800 per month to the marina. Other costs include electricity, sewage pumpout, bottom cleaning, topside cleaning, maintenance, insurance and taxes. These costs could add another $500 to $600 or more per month to living expenses. Another potential monthly expense: payments, if any, on the vessel. Randy Sysol has lived aboard a 55-foot trawler at National City’s Pier 32 Marina with his wife and son for about four years. Transitioning from a land residence to one on the water was not easy, he said. “The process of moving aboard was painstaking as we sold our home of 16 years and divested ourselves of anything that did not fit on the boat. “We did this as we were planning on travelling for a couple of years and didn’t want to be worried about storage of ‘stuff,’” Sysol explained. He continued the relative newness of Pier 32 Marina makes it an ideal location for liveaboards. Being a liveaboard does come with a few pitfalls, Sysol observed, though specific shortcomings obviously vary from boater to boater. One San Diego boater said being a liveaboard could be cheaper than living in a land-based house or apartment, but the affordability of residing in a recreational vessel ultimately depends on marina rates and boat’s type, size and quality. Donna Ethington has lived aboard a boat for decades and currently makes port in Wilmington, which is home to Island Yacht Anchorage, Cerritos Yacht Anchorage, Lighthouse Yacht Landing, Pacific Yacht Landing, California Yacht Marina and Holiday Harbor. 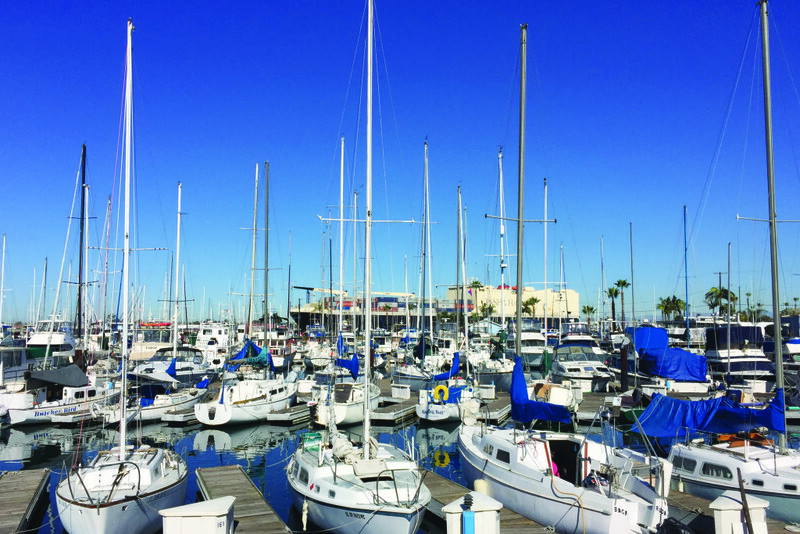 Finding a liveaboard slip at any of the Port of Los Angeles marinas is no easy task. The Port of L.A. limits living aboard a vessel to 5 percent of available slips at each marina. Those who do decide to live along the Cerritos Channel and adjacent the Port of L.A.’s East Basin will find a unique blend of charm and challenges, Ethington said. Liveaboard slip rates in Wilmington are generally competitive and more affordable than marinas in Long Beach or San Pedro, Ellington said. Challenges include frequent ship traffic, industrial noise and air pollution. Ethington added liveaboards in San Pedro and Wilmington play a unique role in watching over local marinas. Neighboring Long Beach allows up to 230 liveaboards, or 7.8 percent of slips, in all of its marinas, according to the city’s marine operations manager, Elvira Hallinan. Shoreline Marina in downtown Long Beach has the highest number of liveaboards in the city, with 169 slips (10.5 percent of the clip count) assigned to those living aboard a vessel; Alamitos Bay is home to 58 liveaboard slips (4.5 percent of slip count) while three vessels at Rainbow Harbor/Marina double as a primary residence (3.5 percent of slip count). A handful of boaters call their respective vessels home at Avalon Harbor, where liveaboards experience busy summers and potentially tumultuous winters. Winter weather is just one of a few considerations liveaboards should take into account before taking residence on a mooring in Avalon Harbor. Boaters planning to stay in the harbor for two weeks or longer must fill out a long-term vessel application and meet the city’s insurance requirements. Moorings are also privately owned, which, according to Bray, means liveaboards might have to change mooring locations on a daily basis. “They may also be moved outside of Avalon Harbor to a mooring in one of the outer coves, Descanso Bay or Hamilton Cove,” Bray added. Access to amenities is yet another factor liveaboards should think about before claiming a mooring in Avalon for two weeks or longer. Current mooring fees range from $31 to $126 per night depending upon length of the vessel; all vessels there are also required to have a working head and be dye-tabbed to insure compliance with the harbor’s no discharge policy. A small number of liveaboard permits are available on the central Orange County coast, where Newport Beach Harbor Resources Manager Chris Miller said the city only permits liveaboards on its offshore moorings. City code permits no more than 7 percent of all offshore moorings in Newport Harbor to be occupied by a liveaboard. Sunset Aquatic Park at Huntington Harbour is home to a couple liveaboards. Whether there are any liveaboards (and, if so, how many) at nearby 325-slip Peter’s Landing Marina was not readily accessible. The Dana Point Marina Co. manages liveaboard permits at Orange County’s southernmost harbor. A prospective tenant must meet certain requirements and pay an appropriate rent and fee to obtain a liveaboard permit in Dana Point. A liveaboard vessel, for example, at least 140 square feet of livable space for one person and an additional 40 square feet for per tenant. The liveaboard fee is 40 percent of the basic slip rent. So the owner of a 35-footer, the smallest vessel allowed in a liveaboard slip at Dana Harbor, would pay $622 in rent plus $248.80 in liveaboard fees for a total rent of $870.80. Liveaboards are also permitted at Redondo Beach and Marina del Rey; liveaboards are not permitted to be adjacent to or across from one another at Redondo Beach’s King Harbor Marina. Are you looking to be a liveaboard? Many marinas provide boaters with extensive information about some of the elements involved, including monthly fees and amenities offered. Some marinas have quotas on how many liveaboards are permitted there or other restrictions. Be sure to visit each harbor or marina website to find out whether liveaboards are permitted there. What restrictions apply to liveaboard tenants? Is there a wait list for a liveaboard slips? How much is the liveaboard fee? Also inquire about amenities, such as parking, security, restrooms, showers, community rooms, WiFi access, and proximity to dining, highways and shopping. So, we are going to buy a boat….approx. 45-50 feet. We will use it occasionally (perhaps in July or August) for a week or so at a time…..maybe in the harbor/marina or going out for the day returning to marina at night…..is this a “live aboard”……we certainly have a home 2 hours from the marina and do not consider the boat as a live aboard but would want to stay overnight a few nights here and there…..does one pay for the fee regardless or an you do it on a weekly basis?…..looking Chula Vista or National City or Shelter Island marinas…..